Grilled Shrimp Or Jhinga recipe by Nazia Nazar at PakiRecipes.com. Devein the shrimp, do not remove the skins. Soak the wooden skewers for 20 minutes in warm water. Mix all of the marinade ingredients together. 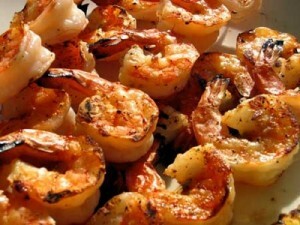 Rub the marinade on the shrimp let it marinate for 1 hour. Skewer the shrimp on the wooden skewers. Grill on a high flame for 6-8minutes. Baste with butter in between. Garnish with a dash lemon juice and cilantro leaves. Serve hot with Mint Chutney.